Frigid temperatures and wind chills are returning to the GTA this week as a mass of Arctic air settles over much of the province. Environment Canada has issued a wind chill warning for the region. After periods of snow Monday morning, the temperature dropped to around -10 C in the afternoon ahead of an expected overnight low of -23 C.
It will feel even colder with a wind chill of -33. To increase services for the homeless, the City of Toronto issued an extreme cold weather alert. When an alert is triggered, the city adds 26 shelter spaces and shelters are told to relax service restrictions. After a shelter reaches capacity, it must allow new arrivals to stay there until they find a bed at a different facility. Overnight, street outreach workers will be patrolling the downtown core and urging homeless people to head to a shelter or another warm place. Until the alert is cancelled, Metro Hall is being used as a warming centre after 3 p.m.
People are asked to call 311 if they encounter a homeless person who is in need of assistance. If it is an emergency, people should call 911. The cold will persist into Tuesday, when it will be mainly sunny with a high of -17 C and a bitterly cold wind chill of -33. 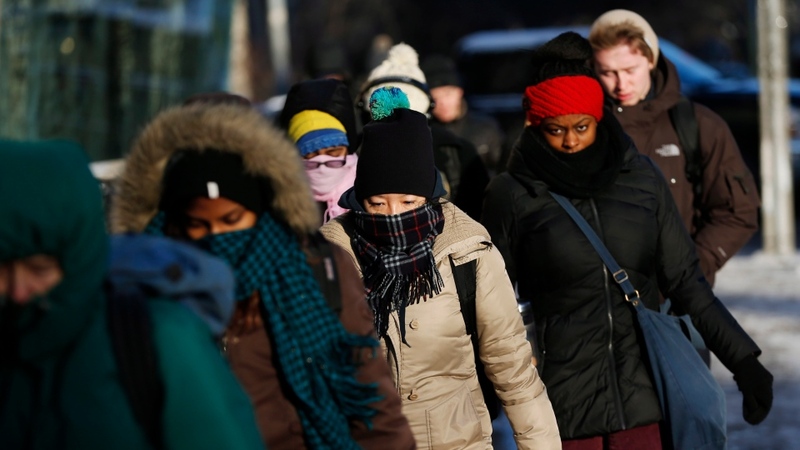 Frigid temperatures returning to GTA, southern Ont.